You can connect your favorite apps and services to Comity and see important updates & content in "Suggestions" feed. 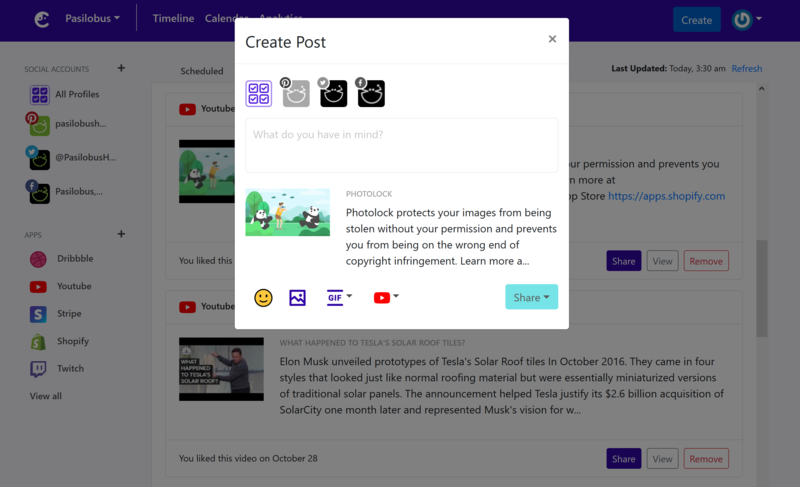 Suggestions Feed is Comity’s way of telling you about items that need your attention and can be worth sharing on social media. Comity will check for important updates in each app you connect. The type of updates Comity check will vary, for instance, if you connect an e-Commerce app such as Shopify, Comity will check for product updates & marketing campaigns happening in your store. If you connect a writing application such as Medium, Comity will check for new articles. 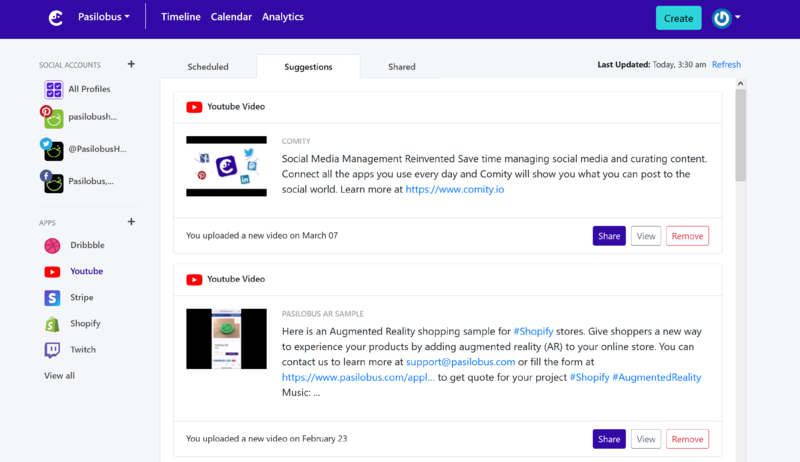 Suggestions Feed can even be filtered when you select an app in the sidebar, so you can prioritize where your attention goes or where you want to share content from. 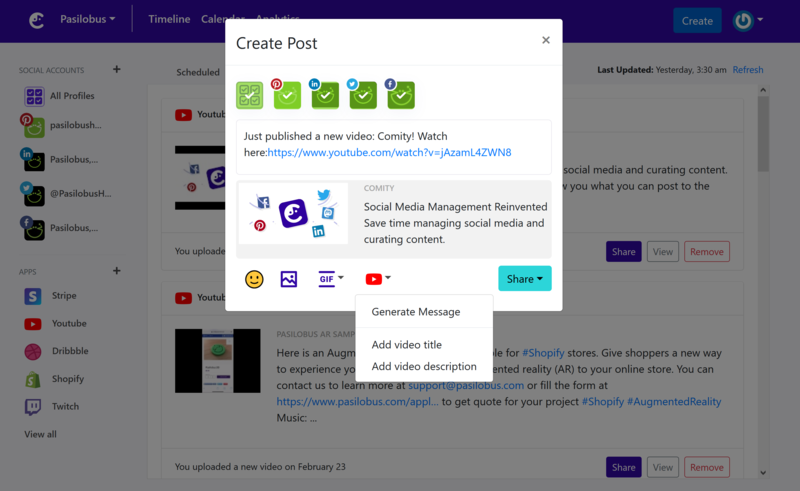 You can choose to share a suggestion to your social accounts with just a click and Comity will capture the image and URL automatically and save you time. Every time you share a suggestion, you will see a message menu appearing in the post editor. 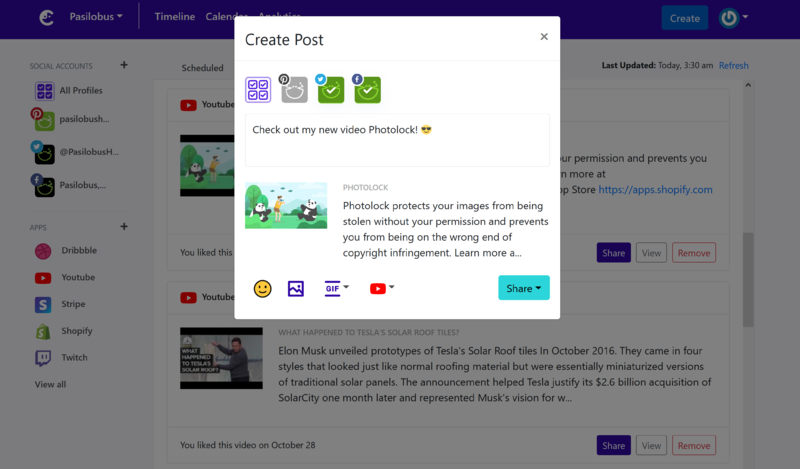 In that menu, you can find important information captured, and message templates you can use to create your post. Click "Generate Message" and Comity will add a full message for you. Or you can create a new message yourself and use other shortcuts to add information easily and save time. Message shortcuts may contain relevant information and supportive metadata, such as statistics, date, title, description, author, vendor and so on. You can use such information to enhance your post or to support your claim and create informative posts. To connect new apps go to the app store from account dropdown that is available at the top right of the screen. To check whether there are any updates in your apps, click "Refresh" link at the top right of the feed. Automated checks are available on Premium and Business plans. Comity can look for updates automatically at certain times of the day and notify you if there are is anything new you can share on social media.